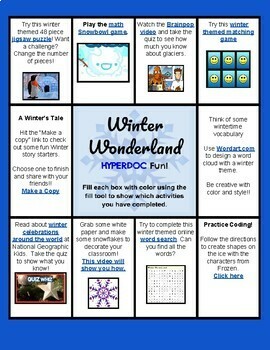 This fun digital resource for the winter season can be used by students independently or in various groupings. It is a HyperDoc and includes links and activities for students to view and/or complete. Please be aware that there is an activity that uses a YouTube video so make sure you have access in your district. It is in PDF format but I am happy to share through Google once purchased if you prefer that format. Please include your e-mail if you would like the Google link. Thanks! -An article and quiz on winter holidays around the world by Nat. Geo. Kids.